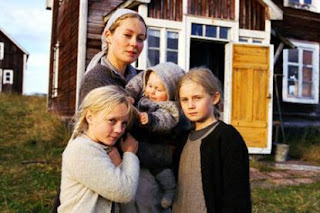 In rural northern Sweden of the early 1950s, little Elina goes to school again after recovering from tuberculosis, the same illness that has killed her father a few years earlier. Elina's family belongs to a Finnish-speaking minority frowned upon by a staunch schoolmistress who starts hounding Elina for speaking Finnish in class and questioning her authority. Elina's mother, sister, and a liberal young male teacher all try to mediate the ensuing battle of wills between Elina and Miss Holm. Elina finds consolation in wandering out on the dangerous marshlands to have imaginary conversations with her dead father. Sweden in the early 1950s. Elina is a member of the Finnish-speaking minority living in northern Sweden. Her father, whom she loved dearly, died of tuberculosis a few years ago. Out in the moor just behind her house, Elina believes that she can still talk to her Dad. She is a very lonely girl. Because she was ill for so long, Elina is obliged to repeat a whole year at school. Her teacher, Ms.Holm, thinks that her new pupil is unkempt; she decides to take her in hand and turn her into neat and tidy schoolgirl.This entails speaking perfect Swedish, not using Finnish expressions and, above all, respecting persons of authority - especially her teacher. The shy Elina, proud and offended by so little attempt to understand her situation, rebels against the way Ms.Holm treats her. A battle of wills ensues, and Elina's only recourse is to refuse to cooperate. Nobody seems able to mediate between these two stubborn opponents.Again and again,Elina takes to wandering out into the moor to try and commune with her father. The situation becomes unbearable. Then, one day while out in the moor again, Elina sinks so deeply into the ground that it threatens to engulf her. At this moment Elina realises that she is not alone; she is loved and needed.When Elina goes to school the next morning, everything is quite different. Even Ms. Holm senses that her pupil will not be intimidated any longer. If you have the opportunity, this is a movie worth watching, both for the content and the beautiful nature depicted. So what is a Lompe?